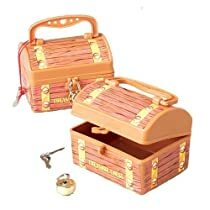 Our Treasure Chests are the perfect favors for your favorite pirates! Each bank features a faux wooden slat design and comes with keys so your pirates can hide their treasures! Made of plastic. Measures 3″ x 4″. Includes 12 chests per package.